REYKJAVIK–As a brown cloud of ash drifts down from the slopes of Eyjafjallajökull toward their truck, Hanna Kaasalainen warns a colleague that their gas masks won’t be much good against carbon dioxide. The masks filter out poisonous gases released by magma such as sulfur dioxide, but carbon dioxide can simply displace oxygen in the air, asphyxiating the researchers as they take ash samples alongside a haze-enshrouded, deserted road. “We shouldn’t stay very long,” the University of Iceland geochemistry graduate student advises, before strapping on a bright yellow mask and opening the door. 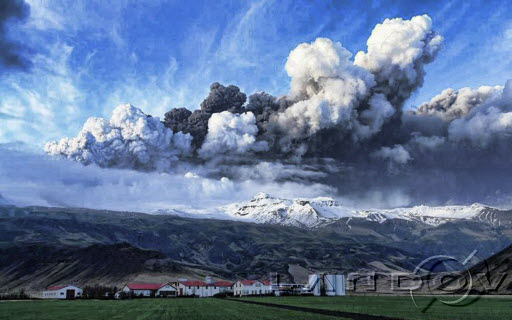 Thanks to Eyjafjallajökull, scores of volcanologists, geologists, and other scientists are now focusing their attention on the southern coast of Iceland. Some are analyzing GPS measurements, seismic readings, and satellite images. Others, like geochemist Michael Burton of the Istituto Nazionale di Geofisica e Vulcanologia in Catania, Italy, are measuring gas emissions that give hints about volcanic behavior. Burton, part of a team monitoring the Mount Etna and Stromboli volcanoes in Italy, flew here shortly after Eyjafjallajökull’s initial eruption on the night of 20 March. His hope is that combining information on gas emissions with traditional volcanology data will better explain the behavior of volcanoes before and during eruptions. In the early days of its latest eruption, however, Eyjafjallajökull remained unpredictable. And some scientists wonder whether the volcano’s recent bursts are a practice run for potentially more disruptive eruptions in Iceland. The last blasts from Eyjafjallajökull, in 1612 and 1821, each preceded larger eruptions from Katla, to the east. And the tragic story of Laki, the volcano just under 100 kilometers from Eyjafjallajökull, looms in the back of Icelanders’ minds. Its eruptions from 1783 to 1785 released a cloud of hydrogen fluoride that coated fields and infiltrated groundwater in Iceland and generated an ash cloud that cast its shadow across Europe. According to some researchers, the resulting poisoning of livestock in Iceland and the cooling effect of the ash may have hurt Europe’s agricultural productivity enough to cause thousands of deaths; the fluoride may have even directly poisoned people (Science, 19 November 2004, p. 1278). Eyjafjallajökull’s so-far-unpredictable behavior offers a perfect example of the challenge facing volcanologists. Before this spring’s first eruption, geophysicists at the University of Iceland and their counterparts at the Icelandic Meteorological Office (IMO) noticed GPS stations on the volcano had wandered several centimeters in May of 2009 and again in December, signs that rising magma was stretching the skin of the volcano in advance of an eruption. In mid-February, Sigrún Hreinsdóttir, a geophysicist at the University of Iceland, placed an additional GPS station on the mountainside. By then, Steinunn Jakobsdóttir, a geophysicist at IMO, was tracking automatic seismic reports that revealed tremors about 5 kilometers below Eyjafjallajökull’s surface. In March, civil authorities alerted nearby residents that they were at risk of floods called jökullhlaups, literally “running glaciers,” if the ice-covered volcano erupted. But officials didn’t order evacuations because the seismic hints weren’t that dire. “Usually when an eruption starts, a low-frequency [seismic signal] is rising when the magma is coming to the surface,” says Jakobsdóttir. Although seismic tracking placed magma closer to the surface on 19 March, this low-frequency signal was absent, so civil authorities kept the alert level at its lowest setting. But the next night, southern Icelanders reported a dark cloud glowing red above the mountain: The volcano had experienced a small eruption, one that led authorities to evacuate farmers living in its floodplains. “We missed [any] short-term warning,” says Jakobsdóttir ruefully. Analyzing gas emissions from dormant and active volcanoes is a growing trend. “Not all eruptions start with a bang,” notes IMO geophysicist Kristin Vogfjörd, who is pushing to add volcanic gas detectors to Iceland’s seismic, GPS, and strain monitoring systems. Indeed, the promise of integrating gas emission studies with other volcano monitoring systems has attracted European funding for a pair of networks that have monitored nearly two dozen volcanoes from Central America to Iceland over the last 5 years. As a result, researchers armed with increasingly portable and affordable instruments are deciphering the gas signatures of distinct kinds of magma, much as a beer brewer might recognize stages of fermentation and different beers with a mere wrinkle of the nose. Magma-released volcanic gases proved their predictive power in 1998. Although seismic signals from magma had tapered off, volcanologists heeded gas signals that Montserrat was not done erupting and thus avoided a potential disaster when the volcano began erupting again in 1999 (Science, 28 March 2003, p. 2027). Since then, interest in gas geochemistry has steadily risen among volcanologists, according to Michael Poland of the U.S. Geological Survey’s Hawaiian Volcano Observatory (HVO) in Hawaii National Park, who himself stuck to monitoring land deformation until he had an eruptive epiphany. In early 2008, HVO staff met to discuss unusually high amounts of sulfur dioxide venting from the Hawaiian volcano Kilauea. Poland thought a summit eruption “was out of the question, since there was no deformation or seismicity indicating magma ascent,” but a gas geochemist argued that one was imminent. Poland laid a wager: If the volcano erupted, the geophysicist would become a gas geochemist or quit his job. Kilaeua erupted explosively three times within a month. Poland has been true to his word. He now says that incorporating gas geochemistry is “absolutely essential for really good monitoring of volcano activity.” Last year, in the 27 August 2009 issue of Geophysical Research Letters, he and USGS colleague A. Jeff Sutton, a gas geochemist, reported that another instance of Kilauea volcanic activity preceded by sulfurous fumes in 2007 could be explained if the magma that left the summit chamber for a side vent lowered local pressure enough to release gases, including sulfur dioxide, that had been in solution in the magma. Burton and his Italian collaborators have also had success relating volcanic gas activity to eruptive activity. “Only about 10% of magma which is degassing ever comes out,” he says, so researchers need to establish detailed relationships between physical signals such as deformation and degassing to predict accurately when magma will emerge (Science, 3 August 2001, p. 774). Burton uses a webcam in his Pisa, Italy, office to guide the latest gas spectroscopy instruments on Stromboli. The team has also used portable infrared spectroscopes there to analyze gases exploding from the volcano’s crater and to compare them with gases emerging when the volcano is quiet. The ratio of chemicals in the gases helped the team estimate the temperatures through which the exploding gases passed and depth at which they separated from the magma—a new kind of measurement (Science, 13 July 2007, p. 227). Setting up a gas monitoring network good enough to predict anything isn’t easy. The UV spectroscopes, for example, rely on a clear line of sight—they need a light source, such as the sun, behind a gas plume. Iceland is particularly tricky for gas detection. Glaciers cover volcanic vents, and frost, wind, and rain would bedevil stationary gas monitoring equipment. “We don’t really know … where to put these gas monitors,” says Magnús Tumi Guðmundsson of the University of Iceland. Getting close enough to a vent to detect gases can also be lethal, as a 1993 accident that killed six scientists on the Galeras volcano in Colombia demonstrated (Science, 16 April 1993, p. 289). Such difficulties are why seismometers, not gas monitors, remain the frontline tool on most closely monitored volcanoes. “Seismicity sees in all weather,” Jakobsdóttir notes. Still, satellites can complement ground-based measurements of volcanic gas emissions: NASA’s EOS satellites carry UV spectrometers, and several research groups use these readings to assess volcanoes across the globe on an ongoing basis, though they lack the continuous coverage ground-based monitoring systems offer. Vogfjörd believes such local gas monitoring is needed if Iceland is to better predict its explosive future. While the world’s eyes are now on Eyjafjallajökull, and its even more dangerous neighbor Katla, she’s making plans to install gas monitoring equipment on Hekla, which erupted in 1970, 1980, 1991, and most recently in 2000. “Multidisciplinary monitoring is the way to go because no one thing is going to show you what you need to know,” she says.